I may be only person that does not like the cold, but I love the Fall season landscape. I am lucky I live in the Augusta, GA area and it doesn't get too cold here. It also takes a bit longer for the leaves to start changing colors, but when they do, it is remarkable! Don’t you wish we could save the colorful leaves year-round? I tried collecting my favorite leaves for a craft project, only to find out that the next day, they had lost their color and had crumpled up and dried out. (Sad face). Upon looking around on the internet, I found various ways to save these colorful leaves. 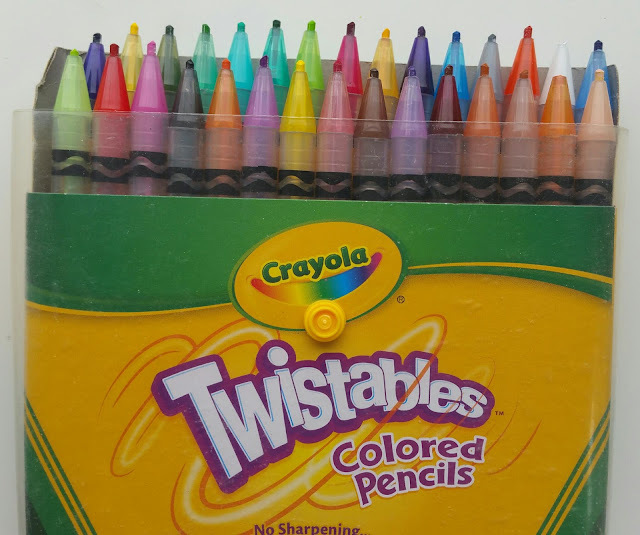 These will help me during my next crafty adventure. -Use Paraffin Wax to coat your leaves. Paraffin wax is inexpensive, at less than $5 a pound. 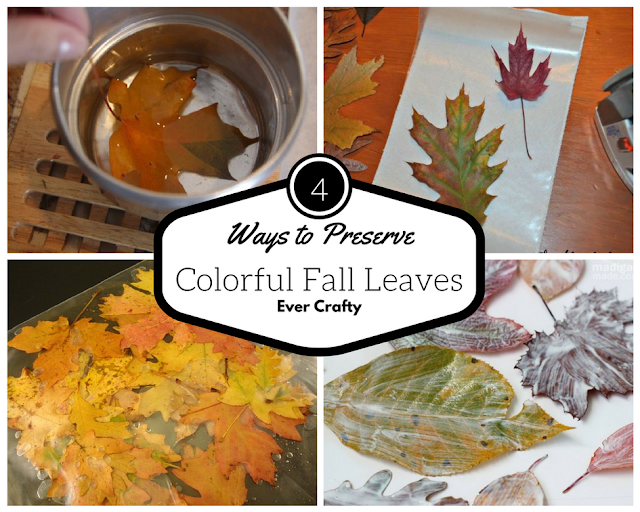 You can preserve a whole lot of leaves with all that wax! Older kids can do this, but younger kids may get burned trying to dip the leaves in the hot saucepan. Image: Lemon Tree Creations Blog. Procedure: Cut a chunk of the paraffin wax you want to use. You can use a regular knife to cut off a chunk, or you can melt the whole block if you have a lot of leaves. Melt a chunk in a small saucepan over your stove. 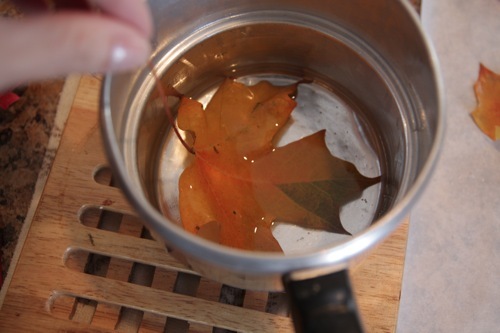 Dip your leaves in the liquid wax. The wax almost sets immediately. Set on parchment paper, while working on the other leaves. The leaves will stay the shape they were when dipped. Make sure you wash your pot well (paraffin wax is used in cooking in small quantities, but I do not recommend eating a lot of it). 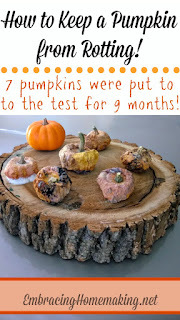 To see how they turn out visit the Lemon Tree Creations blog. -Use wax paper to coat your leaves. This method is the prettiest because it forms flat leaves that can be used in many crafts and showcases the natural shape of the leaves. Also, there is no wait time, your leaves are done after pressing. Procedure: Lay a paper towel on your ironing board or heat resistant table. Next, lay a sheet of wax paper on top of the paper towel, then the leaves you want to preserve, followed by another sheet of wax paper, and lastly a paper towel. (You are sandwiching the leaves between paper towels and wax paper). With your iron on a low to medium setting, press your leaves until they are coated in wax, then flip over to do on the other side. Peel the two wax pieces of paper, and then peel off the leaves. Remember never to iron directly on the wax paper, or you will have wax all over your iron! Even though I love how these turn out, I agree with the blogger that it's time consuming. 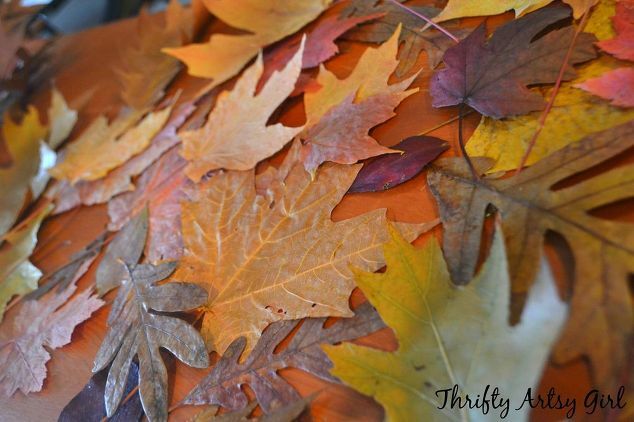 You can only do a few leaves at a time, depending on how many you can fit in the sheet of wax paper without overlapping them. If you want to find out more about this technique visit the Hometalk website. 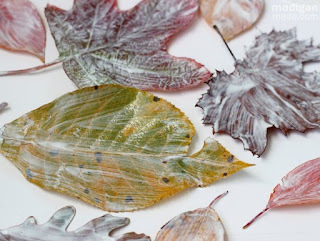 -Use decoupage medium to coat your leaves. You can buy a small tube of ModPodge® decoupage at the Dollar Store now-a-days, and you can pick between either matte or glossy finish. Procedure: Use the sponges to coat the leaves evenly on the first side. Your kids will love using the brushes to help you. Make sure they are fully coated, front and back. Set them on the parchment paper to dry, wet side up. This may take about 30 minutes to dry each side. Then decoupage the other side and lay to dry. Make sure you wash your brushes immediately, or they will be ruined. These don’t lay completely flat, but still turn out beautifully. To get more info on this technique visit the Rosyscription website. -Use vegetable glycerin to soak your leaves. This way takes the longest time during prep, but you don’t have to get dirty. Also, vegetable glycerin may not be that easy to find at your local grocery store, and it costs about $10 for 8 oz., but if you find it this is a mess- free way to save your leaves. 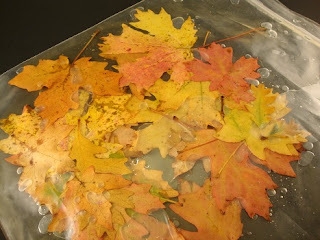 Procedure: Fill the bag with ½ cup of water and ¼ cup of glycerin, mix well, then add your leaves into the bag. Close the bag, trying to get as much air out as possible. Lay flat on a table. Leave in the bag for 6 days. Discard the water/glycerin mixture. 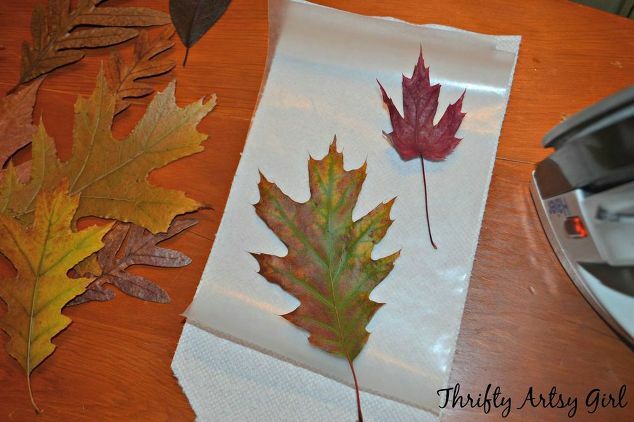 Dry your leaves with paper towels. 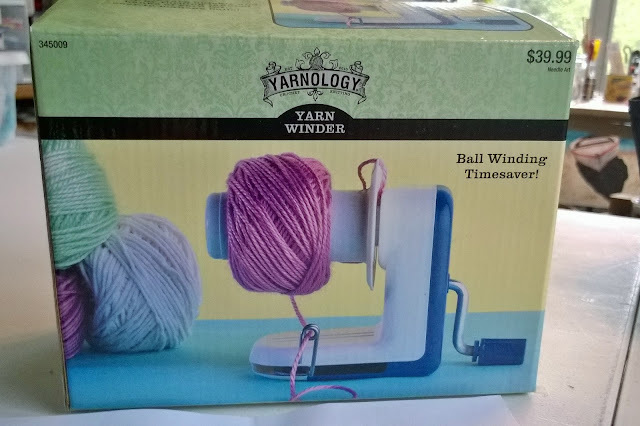 More on this technique on the Mamas Girls blog. EXTRA: Best way to preserve pumpkins! 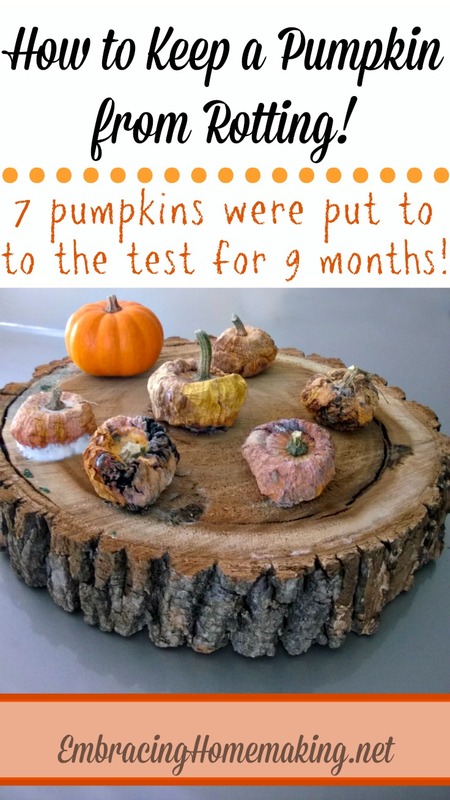 At the blog Embracing Homemaking, they took the time to try different techniques to see which was the best and longest lasting preservation technique for pumpkins. The winner was soaking your pumpkin in a bleach/water solution. The pumpkin lasted for 9 months! To learn more about how to do this visit the blog post here. Are you going to try any of these techniques? I would love to know how they turned out!